After suffering its first home loss of the season Friday night, the Denver Nuggets have now lost back-to-back contests for the first time this year. The Nuggets lost to Memphis in a tight road game on Wednesday, before following it up with yet another close loss to Brooklyn at the Pepsi Center. The Nets’ 112-110 victory drops Denver’s home record to 6-1. Even with the loss, Denver is still sitting in third place in the Western Conference with an overall record of 9-3. Only Golden State (10-2) has a better record so far, and in the one meeting between the two teams, the Nuggets defeated the Warriors, 100-98 on Oct. 21. Here five takeaways from Friday’s home loss to the Nets. Similar to what has happened a number of times this season, the Nuggets struggled to score in the first quarter. Even though Denver shot an efficient 11-of-19 from the field, they were still unable to keep up with Brooklyn’s seven successful 3-pointers. Nuggets head coach Michael Malone explained after the game that despite coming down to the last play, he thought his team lost the game in the first quarter. The Nuggets countered Brooklyn’s seven triples with two of its own, going 2-of-5 from distance in the first quarter. Still, Denver trailed 34-24 at the end of the first and went into the second quarter, trying to slow down Brooklyn’s hot shooting. It did not quite work out how the Nuggets wanted though, as Brooklyn drained two more shots from beyond the arch just minutes into the second quarter. Denver’s defense did finally clamp down and hold the Nets without a 3-pointer for the final 7:02, which allowed the Nuggets to cut into the deficit. Behind the stellar play of Nikola Jokic, the Nuggets were able to outscore the Nets, 23-21 in the second. And after trailing by as 14, the Nuggets went into halftime trailing by seven. Unfortunately for the home squad, the first quarter would end up haunting the Nuggets in the end though. After only attempting one shot on Wednesday night against the Grizzlies, Jokic bounced back in a major way with 37 points on 14-of-22 shooting, both which were season-high figures for ‘the Joker’. With 21 rebounds, Jokic also recorded his eighth double-double of the young season. That play from Jokic gave his him second block of the night along with his third assist courtesy of a no-look beauty to Malik Beasley. Jokic came out firing on all cylinders as he chipped in 11 points on 5-of-5 shooting in the first quarter. 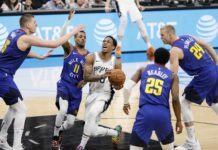 Starting the game 6-of-6 from the field, Jokic was looking for his shot early, and generally had his way with Nets’ big men, Jarrett Allen and Ed Davis. The aggressive nature of Jokic’s play was a big reason the Nuggets stayed in the game and his 21 boards – tying a career high – were key in Denver owning a +12 in the rebounding column. Seven of those 21 boards came offensively, which was played a major role in the Nuggets 23 second chance points. It was great to see Jokic get some confidence offensively as he snapped a four-game streak of scoring in single digits. Even though Denver lost, the fact that Jokic was looking to score again was huge and they will definitely need that same aggressive mentality when the Milwaukee Bucks come to town on Sunday. If there is one thing the Nuggets’ second-year guard has shown, it is that you know what you are going to get from him on a nightly basis. Friday’s game against Brooklyn was no different for Morris as he played a key role in keeping the Nuggets in the game during the first half. His nine first half points came at key points in the second quarter as he was scoring in every way imaginable. Whether it was a tough floater or a timely 3-point jumper, Morris made the most of his 12 first half minutes. Morris finished the game with 15 points on 7-of-11 shooting from the field, while also chipping in six rebounds and two assists. After Friday’s game, Morris is now averaging 3.3 assists per game while also posting a team low 0.4 turnovers per game. 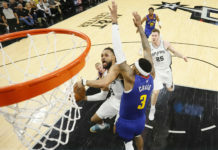 The efficient and effectiveness that he plays with on a nightly basis has been huge in the bench units success, and its something Morris has proven he can do whenever he is on the floor. It’s not often that Harris struggles to score the basketball, but he had one of those nights against the Nets. Harris scored just four points on 1-of-11 shooting, and the veteran guard missed all five of his 3-point attempts in the game. . Even with his scoring and foul troubles though, Harris still found a way to have a positive impact on the game. 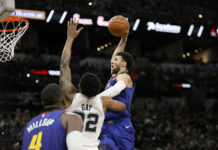 In a game where the whistle never seemed to stop, Harris still played his game defensively, and managed to get his teammates involved with four assists on the night. That shot was obviously the game winner for Brooklyn, but shows just how hard Harris was working on defense. Even though the shot went in, Harris was still playing aggressive and almost forced a steal that might have led to the Nuggets game winning bucket. Certainly a stat line we are not used to seeing from Harris, but should not have any affect moving forward. The only thing Harris has struggled consistently in this season is his three-point jumper as he’s now shooting just 26.8 percent from distance. 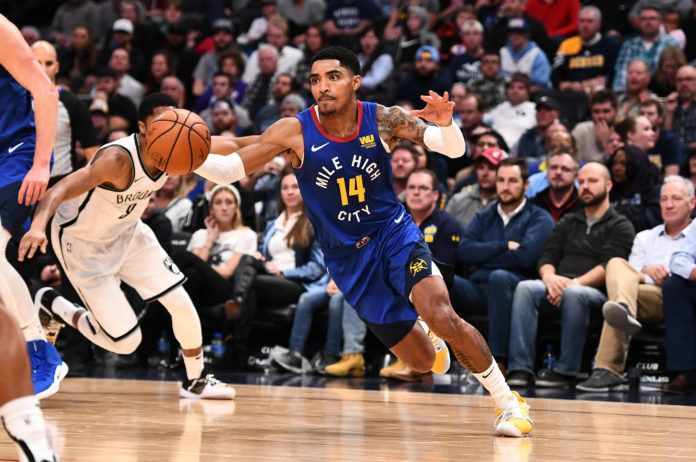 As long as Harris finds his outside jumper, the Nuggets longest tenured player should be able to get his rhythm back when Denver is back in action on Sunday. After going just 5-of-18 from 3-point range against the Nets, Denver is now averaging just 30.7 percent from behind the arc through 12 games. That number is good for 29th in the NBA and is just 1.7 percentage points ahead of the Oklahoma City Thunder. Torrey Craig and Jokic were the only Nuggets starters to make a three against Brooklyn, while Morris and Malik Beasley combined for three off the bench. Through 12 games, Jamal Murray, Harris, Trey Lyles, and Torrey Craig are all players shooting under 30 percent from distance. The relationship all four of those players have is that they are in the top 10 in three point attempts per game on the Nuggets. Murray, Harris, and Lyles are all in the top four and will have to to get their shots to fall if they want the Nuggets woes from distance to end.